Some people, probably most, will take the view that Hitler was simply an evil monster, his wretched life and perverted world view noxious and of absolutely no interest. No sympathy for this devil. Yet he was, to state the obvious, an actual living human being: he liked music (Wagner especially, though not exclusively), films and cakes. He was fond of dogs and loyal to his comrades. And he had not only followers, but people who loved and admired him. 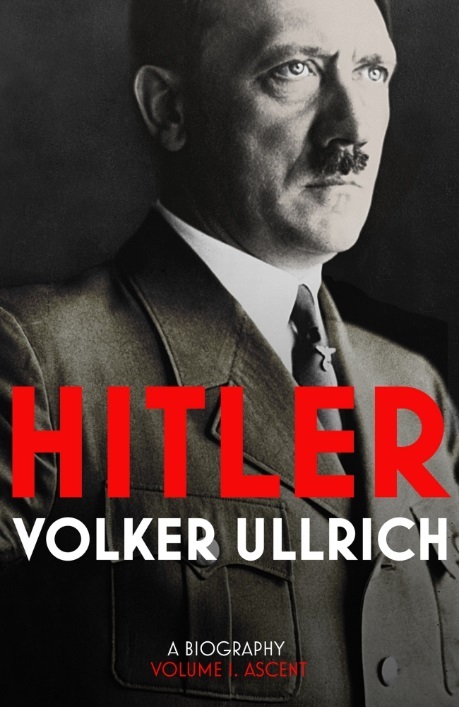 Ullrich has a chapter entitled ‘Hitler as a Human Being’ just to remind us of these facts. The man was also popular for a long period with the German people; he was in touch with his age. That the Great War, a confict where he served dutifully, formed him, there can be no doubt; so too Germany’s defeat (wholly unexpected to Hitler as to many of his contemporaries) and the humiliation of Versailles and the rise of communism within Germany, particularly in Bavaria, after the war. It was there in Bavaria that he met a man who was to be a key influence: Alfred Rosenberg. Rosenberg believed that the formation and rise of the Soviet Union was part of a global Jewish conspiracy (the so-called ‘Judeo-Bolshevik myth’), a notion known to Hitler from his reading of other writers, notably the American tycoon Henry Ford. Hitler’s world view and political programme – to remove the Jews from public life in Germany (to purify the Volksgemeinschaft)and to colonise Eastern Europe – was crystallised in Munich in the 1920s. In all this, there is one thing you have to give Hitler credit for: he was quite open and frank about his intentions from the start. And he was consistent and diabolically effective in following through on them, as we know. We pretty much end the book with the Munich Agreement, a momentary relief after the violence and tyranny of the Night of the Long Knives, the Nuremberg laws and Kristallnacht. The usual tack to take with the Munich Agreement is to comment that Chamberlain was duped and that appeasement never works with dictators: true enough, no doubt. But Ullrich makes a different and a more telling observation, which is that the German people around this time would enthusiastically applaud Chamberlain for his diplomacy wherever he went (so they were clearly duped as well), an occurrence that caused Hitler to become depressed and downhearted. And you can understand why. They want peace these people, you can imagine him thinking, and he wants them to wage a racial war. That’s why he has been rearming Germany throughout his rule. Will they be up to the task? As we know, worse, much worse, is to come. The publisher’s description of the book can be seen here.